When a new employee is hired to a company, there are many factors that have to be looked at and managed. The employee’s information needs to be properly recorded, their schedule needs to be created, they must be introduced to other employees, and a training program may be necessary. It is vital to keep track of all this information, especially if multiple people are being hired at the same time. It may be a good idea to use the new employee orientation checklist Excel template to help with this. 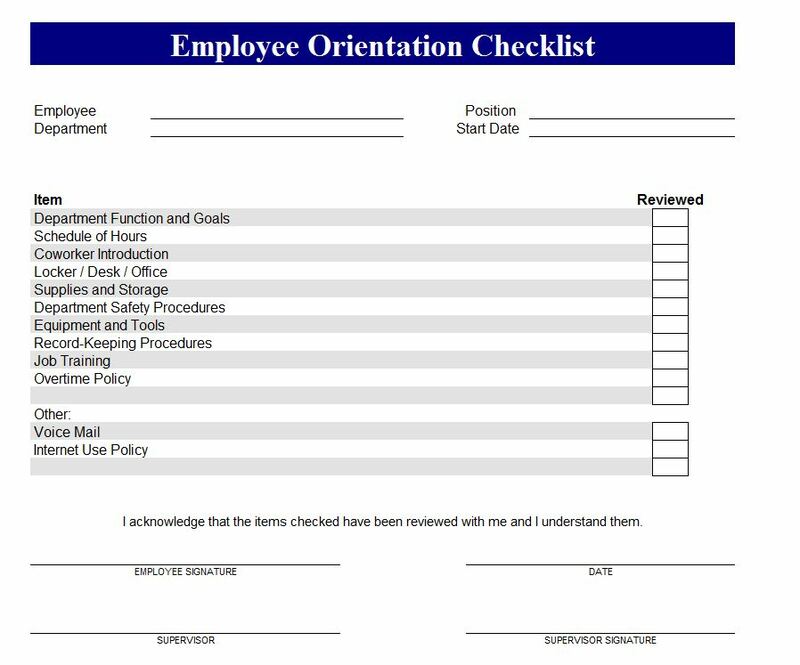 The new employee orientation checklist Excel template is a customizable document that allows you to look at the various items that must be completed before a new employee is ready to start working. The new employee orientation checklist Excel template may be downloaded here. The spreadsheet is available for free, and can be edited as you wish. There are several items already on the checklist, such as department function, goals, schedule of hours, supplies, job training, overtime policy, department safety procedures and much more. These sections can be added to, edited or deleted as you please. Simply print out various copies of the checklist, add the individual worker’s name, and begin checking off items as they are completed. If you have different departments for your business, you may need a slightly different list for each of them. Make sure you save the original list, and save the individual lists by department name. This will give you several templates that are easy to email, send to others or print out. It is a good idea to speak to supervisors and department heads before finalizing the list. There may be certain elements to the list that they take care of, but you do not know about. By getting their input, you will ensure that the list is as thorough as possible. Print out three copies for each employee; one for the employee, one for you and one for the employee’s supervisor. The new employee orientation checklist is so easy to use, and it saves a lot of time. Instead of creating your own template, adding lists, and trying to format everything professionally, you can simply download this file and get to work. It is the most efficient way to get the job done. This new employee orientation checklist is a must for businesses of any size. It does not matter whether you have twenty employees or 200. This free, easy to download list is available now.